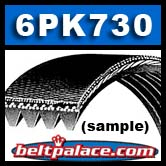 6PK730 Metric Automotive Serpentine Belt (Replaces Gates K060288) 6 Ribs. 6PK730 BANDO Metric Automotive Serpentine Belt. 28.8" Effective Length. 6 Ribs. Replaces Gates™ K060288 automotive micro-v belts, Dayco 5060288, Jobber 288K6, NAPA Part# ATM6PK730.